Work and its counter balance leisure are predominant themes in American life. 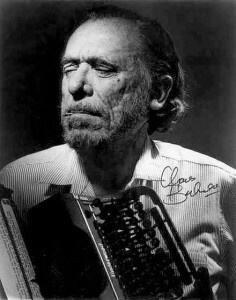 Perhaps for that reason, Charles Bukowski persists as an intriguing and integral persona in the contemporary literary and popular culture environment.For it’s both in his extensive written ourve and in the playing out of his public celebrity that these themes are developed.A fascinating dichotomy is apparent in that his actual life was ostensibly apolitical yet rife with libertarian ethos.There was no philosophical expository writing by Bukowski, yet his narratives demonstrated a pervasive existential kind of conduct.Bukowski In Pictures, with text by Howard Sounes ( Cannongate Books Ltd.) displays an expansive photographic cavalcade of this major post-modern cultural figure in the environments that shaped him and his writing. Tragic yet comical,profane yet profound, puerile and yet possessing sophistication and wisdom. The photographs chronologically display many of the picaresque locales and characters described in Bukowski’s poems,short stories and novels.Also a scattering of relevant chapbook covers,broadsides and fliers that figured prominently in the writer’s career are reproduced.In some of the photos dating back to the 1920’s,we see the writer when he was a young boy with his parents growing up in Los Angeles.The seemingly idyllic scenarios shown belie the hellish real life that was later depicted in his writing.Sounes’ research also showcases an assortment of Charles Bukowski’s relatives and young classmates. Both the photographs and accompanying narrative details of true life incidents are sometimes at odds with the fictitious renderings in Bukowski’s books.One striking example of this is a 1947 picture of Buk.The nattily attired mien of the youthful writer posing at his parents’ California well kept home is in sharp contrast to the popular myth of Bukowski as the itinerant drunk during this era. Bukowski in Pictures does more than take the reader/viewer to the haunts and picaresque havens of the barroom bard.Howard Sounes has deft ability to blend reportage with exposition.Inserted among the pictures of Los Angeles apartments and houses are reproductions of related eviction notices,various correspondences of Bukowski’s friends and lovers,some death certificates and other telling documentation.One of the most striking of these are the pages of Charles Bukowski’s FBI file,of which were not known of in the writer’s lifetime. Unfortunately neither were these files were available to Howard Sounes when he wrote his biography Charles Bukowski: Locked in the Arms of a Crazy life. The large circle of people that interacted within Charles Bukowski’s personal and social realm are also chronicled here.There are several pictures,including wedding photos,of Bukowski and his last wife Linda Lee .Actor Sean Penn appears, as does singer/songwriter Shel Silverstein. Photographs of many of Buk’s L.A. hangers- on,local acquaintances and some real life characters that appear in his fiction also make an appearance. Photos of rare chap books and book designs from Black Sparrow and smaller publishers also are represented.Also featured are selections by various West Coast contemporaries such as Neeli Cherkovski and Jory Sherman that pertain to the literary scene that was the background for Bukowski’s writing.This material brings to the fore the actual real life identities of many of Buk’s fictionalized contemporaries.In tandem with Howard Sounes’ chronological narrative,these comprehensive pictures and reproductions do much to flesh out the visuals that set the scene for the essence of Charles Bukowski’s spirited poetry and prose.